While his works were of exquisite composition, the depictions were calm and without much expressiveness, giving a highly formal and serious religious tone. His first signed and dated piece is the Madonna of the Arbour, or Madonna with the Orange Tree, from 1489. 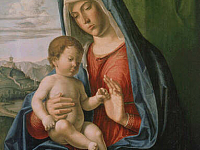 He went on to paint several depictions of the Madonna and Child, but quite uniquely of the time he often painted them with elaborate landscape backgrounds, such as his piece, Presentation of the Virgin Mary at the Temple, from 1500. While the figures in his early works were somewhat rudimentary, he eventually developed a gracefulness in rich colors. 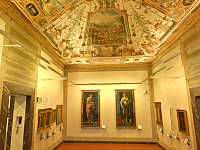 The start of which can be seen in his Madonna and Child from 1504, now at the Uffizi Gallery. His other notable works include The Incredulity of Saint Thomas with Saint Magnus Bishop, from 1505, The Madonna Enthroned with the Child or The Madonna Montinini from 1507, The Virgin and Child Enthroned with Saint John the Baptist and Mary Magdalen from 1513.